Zilmax: The cattle growth drug that’s making beef more like chicken. A new cattle drug called Zilmax is being widely used in the industrial feedlots where most of America’s beef comes from, but not because it produces a better sirloin. 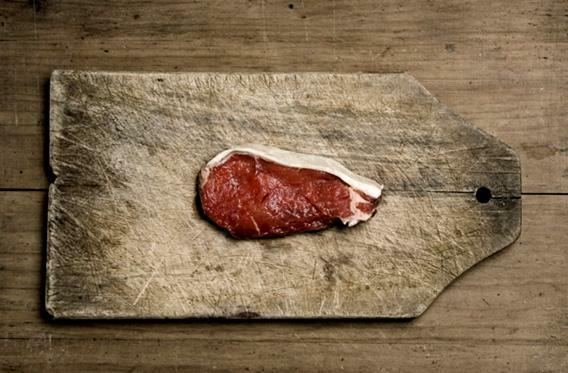 In fact, it has been shown to make steak less flavorful and juicy than beef from untreated cattle. Many feedlot owners, big meatpackers, and at least one prominent industry group resisted the drug, worrying that the beef industry would turn off consumers if it started churning out lower-quality steaks. So what accounts for the sudden popularity of Zilmax? Zilmax is a highly effective growth drug, and it makes cattle swell up with muscle in the final weeks of their lives. And despite concerns within the industry, the economics of modern beef production have made the rise of Zilmax all but inevitable. The beef industry has been shrinking for decades, a problem that can be traced to cheap chicken. Poultry companies like Tyson Foods figured out in the 1930s and ’40s how to raise chickens in a factory-like system. Using a business model called vertical integration, poultry companies like Tyson began to control every aspect of animal production, from the hatchery to the farm and the slaughterhouse. After the dawn of vertical integration, chickens were raised in barn-like warehouses on the farm, killed and butchered along assembly lines nearby, and, later, shipped out to big customers like McDonald’s and Wal-Mart—with every step of the process dictated by the same company. In the 1990s, the same model was widely applied to pork production, cutting out the middlemen and leading to a drop in pork prices (after adjusting for inflation). As chicken got cheaper, it took top billing on fast-food menus. Beef got pushed aside. Some companies have tried to vertically integrate cattle production, but it has never panned out economically, thanks to the stubborn biology of cows. Chicken and pigs have offspring in big numbers, which lends itself to industrial-sized barns. (Hens lay a steady supply of eggs that yield full-grown chickens in about two months; sows bear big litters of piglets that reach maturity in about six months.) But a cow can only have one calf at a time, and the gestation period lasts nine months. After that, a calf suckles from its mother for about four months. It would be exorbitantly expensive to confine that life cycle in a warehouse, since the cow and calf would have to be sheltered and fed for over a year, just to get one full-grown heifer out of the deal. As a result, the vast majority of calves are still born and reared on wide-open ranchland, where herds of them eat free grass and stick by their mother’s side. But cattle producers still imitate the heavily industrialized chicken industry to compete. Zilmax is part of a new regime for raising cattle that emphasizes higher production and cost-cutting wherever possible. This regime is what created the modern-day feedlot, where thousands of cattle, after being raised on open ranchland, are corralled on muddy hillsides to spend the last few months of their life eating corn. It is also what necessitates the battery of pharmaceuticals and feed additives that cattle must consume to stay healthy and gain weight—as Michael Pollan and others have noted, cattle didn’t evolve to digest corn, so they easily become sick on feedlots without careful monitoring. Even with these advancements, the cattle business is still divided in half: On one side are independent ranches and feedlots that raise cattle; on the other side are big meatpackers that buy cattle from feedlots, slaughter them, and sell the beef. The relationship between cattlemen and meatpackers veers between amiable and adversarial. Neither can succeed without the other, but both are desperate to increase profits. Enter Zilmax. Originally developed to treat asthma in humans, it was later found to be a “repartitioning agent” in cattle, changing the animals’ metabolism so they produce more muscle instead of fat. While this can boost the amount of meat per carcass, it can remove the very qualities that people like about beef, like the fatty marbling that adds juiciness and flavor. In 2006, Intervet Inc., the company that originally made Zilmax, won approval from the U.S. Food and Drug Administration to use it in the food supply, even after noting in its application to the FDA that “overall tenderness, juiciness, flavor intensity and beef flavor were all statistically different [in Zilmax-treated beef] compared to controls.” (Intervet’s application also said consumers probably wouldn’t notice the lesser quality.) The drug was launched commercially in the United States in 2007 and is now sold by Merck Animal Health. At first, meatpackers greeted Zilmax with skepticism. Early research showing the harmful effects on beef quality scared off many feedlot owners who would have purchased it. By the late summer of 2011 only two of the major meatpackers, Tyson Foods Inc. and JBS SA, accepted cattle treated with Zilmax, according to feedlot managers and the companies. Cargill, which was concerned about quality, didn’t accept Zilmax-treated cattle until 2012. National Beef Packing Co. refused to comment on its Zilmax practices for this article, but according to feedlot managers, that company also began accepting Zilmax-treated animals last year. Those four major meatpackers control roughly 85 percent of the market, so when they decide to accept a new practice, as they now have with Zilmax, its implementation is swift across the entire beef supply. As Zilmax gains popularity, it is creating a kind of positive feedback loop. As more feedlots use it and more meatpackers accept it, more of their competitors feel pressured to do the same just to keep up, even if they have concerns about Zilmax’s effects. Cargill, for instance, accepted Zilmax only grudgingly. Cargill’s own studies found that Zilmax can hurt beef quality, and for years the company had a policy of refusing to accept cattle treated with the drug. But by the middle of 2012 Cargill felt it had no choice but to accept Zilmax-treated cattle. Meatpackers like Cargill buy cattle from independent feedlots, and Cargill decided that too many feedlot managers were using Zilmax for the company to keep refusing to accept it. “To keep our plants running and meet customer demand, we find ourselves in a position where we must harvest cattle that have been fed growth promotants” like Zilmax, Cargill spokesman Mike Martin said in a statement. In turn, feedlot owners find themselves in a squeeze. Allan Sents, co-owner of McPherson County Feeders in Kansas, resisted using Zilmax for years. But now he’s worried he can’t afford to continue doing so. Sents raises about 11,000 cattle at a time on his feedlot and sells many of them to National Beef. National, like many other meatpackers, determines how much to pay for many of the cattle it buys based on a number of factors, including weight and the fattiness of their meat. Each National plant grades cattle against the average amount of meat on each carcass that it slaughters, Sents said. As more of Sents’ competitors use Zilmax, the average amount of meat on each carcass at the National plant is rising, leaving Sents behind. “In essence, you’re going to be discounted if you don’t use it,” Sents said of Zilmax. Last year, the already battered cattle business faced a crisis. Drought caused grain and feed prices to hit record highs, and feeding cattle became too pricey to be profitable in many parts of the country. Many ranchers sold off their cows for slaughter prematurely rather than spend more money to fatten them up. The drought created a perfect opening for Zilmax. Now, drug salesmen are roving Middle America, pitching Zilmax as an antidote to hard times in cattle country. With Zilmax, a feedlot owner can get more meat from a cow without feeding it any additional grain or letting it drink any additional water. According to one Zilmax salesman, using the drug could help a feedlot owner make about $30 in additional profit per cow by adding about 33 pounds of extra meat to each carcass. But the tradeoff between quantity and quality is one some insiders don’t think the cattle industry should be making. Among the more vocal critics of Zilmax is a prominent trade group, Certified Angus Beef, which was formed in 1978 in an effort to boost beef demand. Certified Angus Beef is a label awarded to beef that meets certain criteria, like being juicy, marbled, and flavorful. (Certain breeds naturally produce better-tasting beef, as do animals that are fed lots of corn.) The group’s standards are stringent—only the top 8 to 10 percent of all beef receives the group’s brand—and Certified Angus Beef President John Stika sees a push for higher quality as the industry’s best path to success. “Why do people buy beef? They don’t buy it because it’s cheap. They buy it because of its taste,” Stika said. Stika has warned for years that using Zilmax could undermine long-term demand for beef. In a 2008 editorial in the industry magazine Beef, Stika wrote that the use of drugs like Zilmax reflects “a ‘pounds first’ heap of indifference to quality.” He understands that Zilmax might deliver short-term profits by boosting the amount of meat on every carcass, but he knows from experience that this might not help the industry in the long run. Stika points to years of declining beef demand as cattle producers tried to out-chicken the chicken business by producing more standardized, leaner meat at feedlots while trying to cut costs. “We didn’t gain market share by producing a lower quality product more affordably. We lost market share to other proteins,” Stika said. Of course, Zilmax’s manufacturer claims the drug doesn’t affect quality, if used correctly. David Yates, a national account manager at Merck Animal Health, says many peer-reviewed studies that support his claim that there are no adverse affects on quality if Zilmax is used for 20 days, as the company recommends. It is impossible to determine how long any given feedlot actually feeds cattle Zilmax, because they don’t have to report it. Those studies, however, were funded by Intervet, the company that first developed Zilmax. Yates also cited a study by Texas Tech University that found consumers couldn’t tell a difference between Zilmax-treated beef and non-Zilmax beef in a blind taste test involving 3,000 people. “Steaks from cattle fed Zilmax were as tender, as flavorful, and as juicy,” Yates said. A 2012 investigation by the Chronicle of Higher Education found that many academic researchers studying Zilmax get funding from Merck or Intervet—and indeed, the Texas Tech study mentioned by Yates was also funded by Intervet. The debate over Zilmax’s impact on the beef quality is probably moot, though, seeing as administering the drug is becoming standard operating procedure at feedlots. What this means for consumers is that the American sirloin of tomorrow will be a lot more like the chicken breast of today. There will still be high-quality steaks, like those promoted by Certified Angus Beef, available in pricey restaurants or upscale grocery stores. But the rest of the beef market will continue to drift toward the middle-point, where meat is standardized, less flavorful, and in need of serious processing to taste good. Who knows—maybe a scientist somewhere is working on the Beef McNugget at this very moment. Slate’s coverage of food systems is made possible in part by the W.K. Kellogg Foundation.